Installing and commissioning a water heater is a very different process to the one you would carry out for a boiler. Dan Martindale has put together a guide to the key stages of commissioning a water heater. Commissioning can be complex, but installers can avoid common pitfalls by referring to best practice guidelines and working closely with suppliers, following guidance and taking up training where offered. However, there are common guidelines that must be followed for all heating products, such as checking the gas supply before installation and making sure that all equipment meets current regulations. Commissioning is an extremely important and necessary part of any plant installation process. It’s the only way to ensure it has been correctly installed to industry standards and that it will operate according to the manufacturer’s instructions. 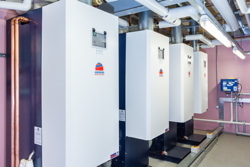 It’s crucial to follow the commissioning process for the particular product you’re installing but here are the steps that every engineer should take to ensure the basics are covered when it comes to water heaters. 1. Carry out visual checks on the installed water heater. Check there is sufficient ventilation, the flue and pipework are present and correct, and all ancillary valves have been fitted in line with current regulations and have been installed in accordance with manufacturers’ instructions. There have been instances where engineers have gone to commission a product and the installation has not even been completed – so it’s vital these checks are carried out on arrival. 2. Make sure the water heater is completely full of water and vented. Filling the water heater is relatively simple but the process does vary between models and manufacturers. 3. Check the gas supply has been purged. A common issue we come across when commissioning is insufficient gas supply due to incorrect pipe work sizing, or the wrong size gas meter installed. 4. Check the 240V power supply is switched on and all external wiring is intact. The phase and neutral should be correctly connected to the water heater. 5. Open the water heater’s isolation valve. 6. Adjust set point temperature to force a demand. The set point would be determined by the customer but stored water must be above 60 degrees in order to kill harmful legionella bacteria. A water treatment programme should be put in place during install to prevent the build-up of silt, sludge and limescale in the system and protect against legionella. Some water heaters have an in-built anti-legionella programme for extra protection. 7. Adjust the CO2 values in line with the manufacturer’s instructions. Check that the gas pressure conforms to current regulations and carry out a gas rating of the appliance. 8. On completion, the commissioning report should be written and signed, with a copy given to the customer. 9. Explain to the customer how to operate any controls, such as the thermostat, and any user instructions concerning the water heater. By following these steps, you can ensure the water heater operates in a safe, efficient and cost-effective way. Commissioning must be carried out by a Gas Safe Registered engineer with unvented systems training. 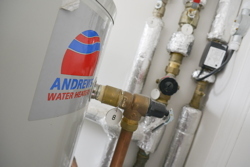 Andrews Water Heaters provides a commissioning service. Customers whose products are commissioned by us will qualify for a two-year warranty instead of the standard one year. Customers are also supplied with a log book to record initial operating settings and any future maintenance work. Once a system is up and running, it is also important to put in place a programme for regular system checks and servicing. Periodic flushing of the system as part of a regular maintenance schedule can easily remove it silt and sludge that can build up over time and affect operation. Here, Building Information Modelling (BIM) can play an important role. Building managers can access key information on the design of a system and all the components to identify any underlying issues affecting water hygiene and address them during remedial and maintenance works. Many manufacturers now offer BIM files so it’s essential to check if these are available for the product being installed. By following the manufacturers guidelines on commissioning and putting in place an appropriate water treatment programme and maintenance schedule, engineers can ensure a job is well done and, most importantly, the end user has a product that will operate sufficiently for years to come. Dan Martindale, is sales director at Andrews Water Heaters.